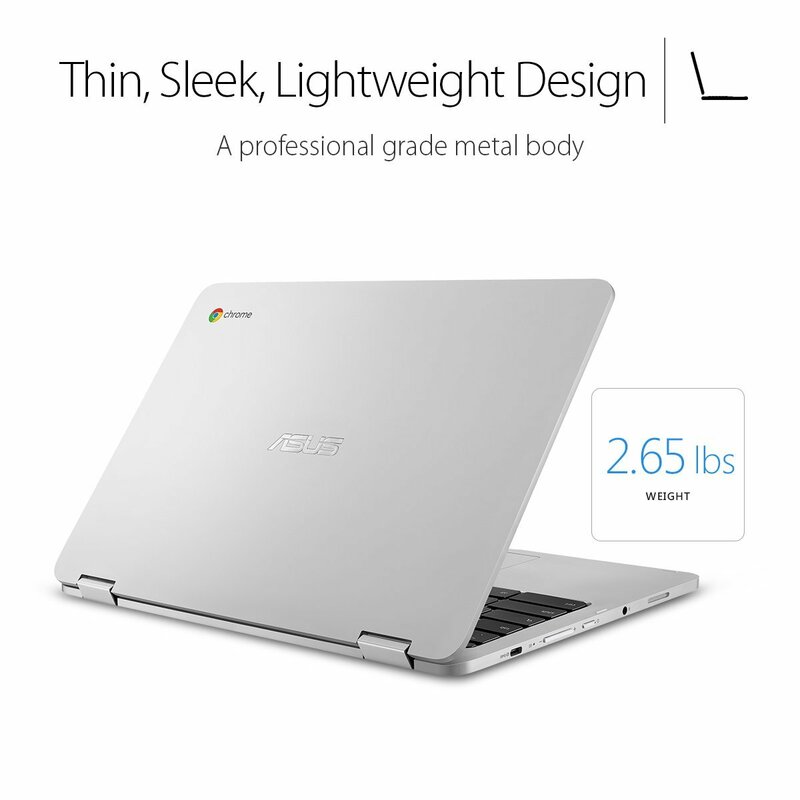 ASUS Chromebook Flip C302CA-DH54 is a 12.5-inch 2-in-1 touchscreen laptop with a very modern design and a compact and lightweight chassis, a Full HD display, a backlit keyboard, power efficiency and all-day battery life, and fast and efficient processing power that makes it good enough for the pros. Technical specs include the the quarter 4 2015 release dual-core Intel m5-6Y54 (4MB cache) at 1.1GHz that goes up to an impressive 2.7GHz speed with turbo boost, 4GB LPDDR3 memory for multitasking ability, 64GB flash Solid State storage that is plenty for a Chromebook and the Chrome operating system with anti-virus and updates in the background without you needing to do anything manually. It starts up in only 3.5 seconds and also wakes up from hibernation and shuts down very quickly. You’ll get free 100GB Google Drive cloud storage where you can keep all your data, documents and photos safe and access wherever you want if you think 64GB built-in storage will not be enough. You have the option to get it with the Intel Core m3 processor at 0.90-2.2GHz speeds at roughly 170-180 dollars less at the time of this review (Asus Flip C302CA-DHM4 model) and you can add Google’s G Suite Business Package Trial without paying extra. The benchmark score for the Core M5 is 3326 and 3051 for the Core M3. It weighs only 2.65 pounds and measures 12 x 8.3 x 0.5 inches- is lightweight and thin, perfect for taking on your domestic or overseas travels. It has a modern and flexible design with an aluminum metal body and very strong Corning Gorilla Glass offering overall durability and the screen rotating around the 360-degree hinge and you can use it in either laptop, tablet, tent and stand modes. 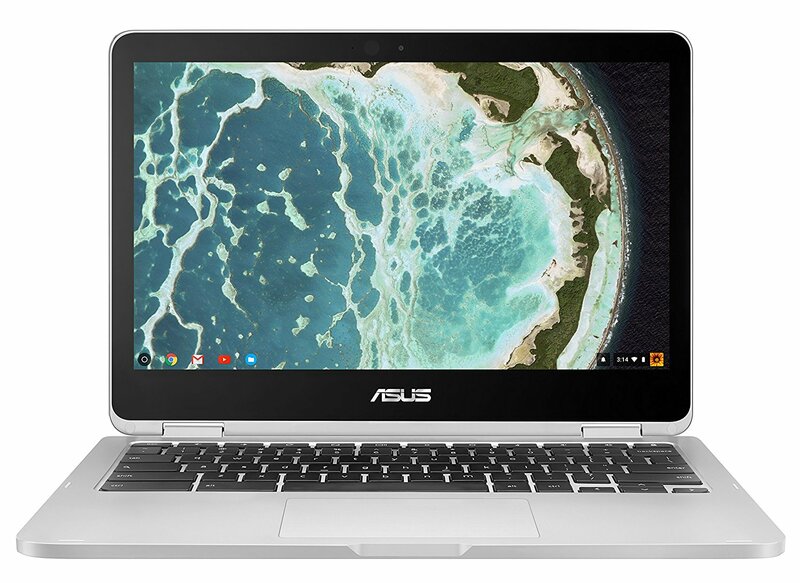 Asus Chromebook Flip C302CA has an average battery life of up to 10 hours from its lithium-ion battery for things like video streaming or web browsing. Battery life depends on how you use the system and it will decrease by time. You can leave your charger at home and take it anywhere you go without having to be near a power outlet. You can have many tabs open on your Chrome browser and there will be no slowing down or freezing. If you’re not familiar with Chrome systems, pretty much everything happens online and you’ll be using the Chrome browser the whole time. And you have access to many online and offline Google Chrome web store apps for whatever you want to do- work, entertainment, and Chrome games: Google Docs, Google Photos. The anti-glare 12.5-inch Full HD screen with IeDP (Embedded DisplayPort) Wide View IPS panel has the 1920 x 1080 pixel resolution and great 178 degrees horizontal and vertical viewing angle for also sharing content with other people. You can enjoy the vibrant visuals and smooth graphics on your apps and games. It has a full-size chiclet-style backlit keyboard without a separate numeric pad, with a 1.4mm key travel and great solid typing experience. The touchpad is the best we have seen on any Chrome system so far and it even has the palm rejection function that differentiates between an actual fingertip and palm so there are no unwanted movements. Connectivity options include the latest 802.11ac wireless with up to 3 times speed than the 802.11bgn, Bluetooth 4.0, the most advanced 2 x USB 3.1 Type-C ports (and reversible plug orientation and cable direction), a regular audio jack and a Micro SD expansion slot. This is not the best system to use in tablet mode but it is still more than adequate and they are working on making it better with more 2-in-1’s coming out on the market. As a Chromebook, it offers quite a bit of horsepower even for professionals that are in need of a Chrome system. It is the best Chromebook we have reviewed so far with some of the best internal components, great build quality, and technical specs and it can certainly handle heavy usage for both work and entertainment purposes. It can easily be compared to the latest Samsung Pro and Plus models.